"EBC 5300m " is a film about the Everest Base Camp. 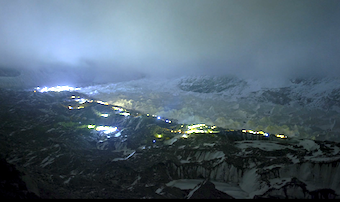 The camp, set on a glacier, is assembled and dismantled every year for a period of 2 months. Between guides, cooks, government officials and guests, it houses a little bit less than 1,000 people. The film, throughs ambiences, shows the life and organization in the camp, and exposes the contrast between this ephemeral micro-city and the wild and mystical environment in which it is located. It purpose a reflection on the overcrowding of the most prestigious and most widely summits and the emergence of extreme forms of tourisms.